As you continue to introduce your child to kitchen appliances, teaching kids to use a blender is one area that you have to make sure you are confident about their safety before letting them try it alone. Blenders have the double danger of electricity and sharp blades, so your training should start with a safety lesson before moving on to how and what to blend. 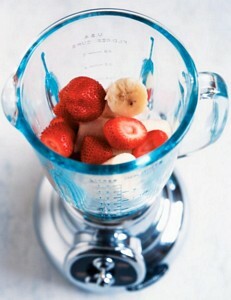 Teaching kids to use a blender will help save you time and will expand their repertoire of skills and recipes. However, you need to make sure that they are aware of the potential dangers from electrical items, and the sharp blades in the bottom. Start your lesson with a demonstration of how powerful it can be by blending something tough, such as potatoes or carrots. Give your child one of the objects the machine blended and ask them to break it with their hands. Then ask them to imagine how sharp the blades must be and how fast they must be going to break it down. This should instill respect for the blades. Follow this up with a short talk about not mixing water with electrical items, and your child should be ready to try blending for themselves. Here are some of our favorite blenders for teaching kids to use a blender. Put out a variety of food stuffs, including liquids like milk, semi-solids like butter and solids like chocolate. Ask your child to make a prediction as to what will blend and what wont and then have some fun trying all the different items out. Take some differently colored fruit, such as strawberries, grapes and blueberries and put them in different bowls. Take turns with your child to blend different combinations to make different colors. You can also do this with white bread and food colorings, but the fruit will be tastier to eat afterward. Try any smoothie recipe for this. Once you feel happy that theyve mastered these challenges, you can begin to allow them to use the blender for their own projects. However, teaching kids to use a blender should be a supervised activity at all times, even if it just means that youre in the same room as them when they are using the machine. The final part of any training you do with your child in the kitchen should involve the cleaning of the utensils that theyve been using. This will help you keep the mess to a minimum and also teach the responsibility of the chef to leave the kitchen ready for the next user. Blenders are not hard to clean, as most will unscrew at the bottom, allowing little hands to wipe the blades clean safely. Be sure to supervise this the first few times, with reminders about the safety issues. Being able to use a blender will increase the number and variety of recipes that your child can make. Teaching kids to use a blender can feel quite stressful, especially when theyre blending hot liquids, but if you approach the situation calmly, your child will respond calmly. Always allow more time than you think necessary when youre training your child in the kitchen and be sure to keep your tone of voice positive. When our girls were young, it was a chore to get breakfast into them. My husband often offered smoothies.....like this one with a secret ingredient. This is all done on how much you feel like making and by your own taste. When I make it it's meant for 2 servings.